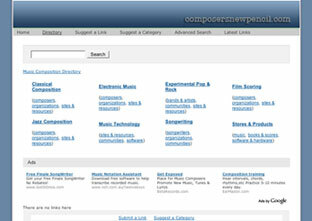 We are very excited to introduce Composersnewpencil’s music composition link directory. If you are a composer, songwriter, etc., please feel free to submit your site(s) or your favorite music composition related website(s). Our intention is to build a targeted and quality content directory. All links will be personally reviewed for consideration. The main categories include: classical composition, electronic art music, film scoring, jazz composition & arranging, songwriting, experimental pop & rock, music technology and finally stores & products. Subcategories include: composer and artist sites, resources, communities and organizations among others. New categories can also be suggested. The directory is brand new, so some categories do not contain links yet. All feedback is welcome. You should check out jamstudio.com It is a songwriter within a browser. Just think…no need for a studio or all that gear and expensive software. I personally think that it is a move in the right direction.